We are currently at 7-12(design, creation, delivery) business days for turnaround time. Priority Mail takes 3-4 business days. Express Shipping takes 1-2 business days. Also, we use FedEx and UPS for some regions. USPS does not guarantee RUSH shipping, although delays are rare that they can happen. USPS does not refund shipping charges if a package is delayed, so the best option is to always order in advance to allow enough time to receive your order! (For International orders please messages us for shipping times). *Please be sure all of your details INCLUDING shipping address are correct before you check out. We are in a system that automatically processes your order once it is placed and it goes into production. We are not able to change details or shipping addresses! *We do stand behind our product and will replace an item that is damaged during shipping. © 2013-2019 OC Canvas Studio LLC. All rights reserved. The artwork is for personal use only & may not be resold or published online. The product was great and the seller was even better. Top notch customer service! Thanks for helping me out. Absolutely fantastic work, great communication, and fast shipping. I am very happy with the quality of the print, would highly recommend this seller. 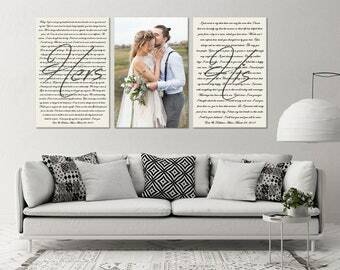 Your favorite wedding photo customized with your song music sheet! Made to order! Unique Anniversary Gift! 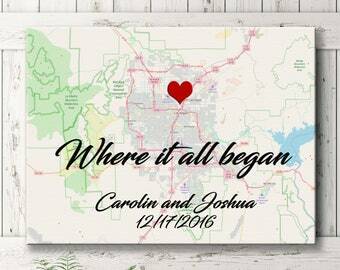 Custom Map Canvas Print! 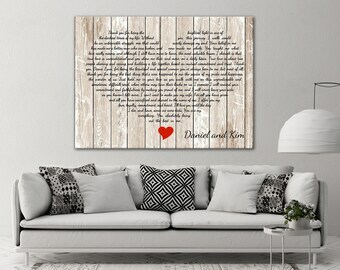 Unique Anniversary Gift Idea! Personalized with any location! 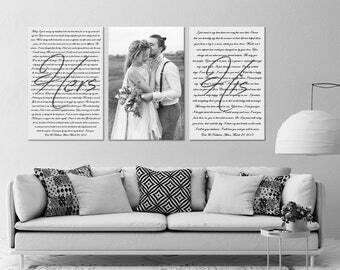 Home decor canvas! Made with your personal photo and vows! 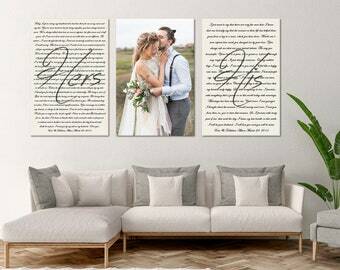 The Canvas Prints from OC CANVAS STUDIO are created from start to finish "in-house". 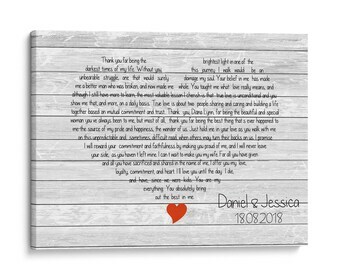 When you give one of my personalized products as a wedding gift, graduation, anniversary, engagement, birthday or housewarming gift, you are giving a gift with sentimental meaning attached to it. 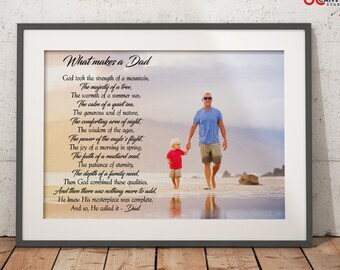 You can personalize your product with your own special quote, lullaby, song lyric or verse! 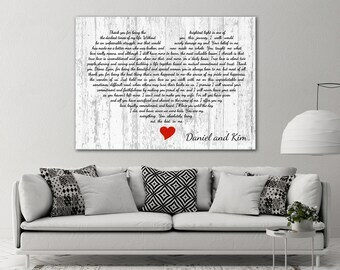 These custom prints make great gifts for Weddings, Anniversaries, Births, Nursery Decor, Graduation, Christening, Godparents, and Baptisms! I would love to work with you to create your own unique and personal gift, feel free to contact me via Etsy message. Hello and hope you'll enjoy your shopping experience here. If you have any questions at all, feel free to contact me first before ordering. I usually answer messages within 48 hours with the exception at times for Friday through weekend messages since I try not to work weekends. If you have any issues with orders, don't hesitate to message me first to resolve problems before leaving unfavorable feedback/reviews. Usually, things can be solved by communication. All customized/personalized items are final since they are made to order. The customer takes the responsibility to check the preview/design text before any approval. No refunds or exchange are offered on custom orders if a design proof/preview was created. 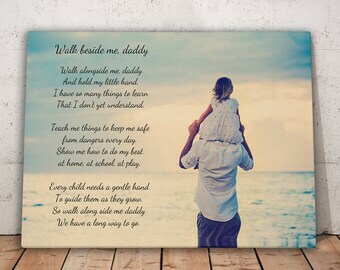 We do offer new canvas if you receive your package damaged during the shipping, please let us know we will work to resolve it. All major credit/debit cards through Direct Checkout and PayPal. 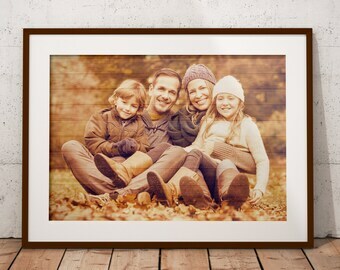 OC Canvas Studio requires payment before any orders or proof images are created. All personalized/custom orders will be sent a proof image for your approval before printing. We will not create or ship your order until the proof has been approved. Most items are made to order usually so the processing time can range from 4-9 business days, though I try my best to make it 3-5 business days at times. If you need something quicker than normal, make sure to message me so I can give you a sense of timing beforehand or arrange for shipping upgrade. I would recommend at least 3 weeks prior to events just to give room for error or delays from USPS on US domestic orders and 5 weeks for international orders. We use USPS Priority/First Class Mail or FedEx depending on cost and shipping location. We insure all packages. If you'd like a tracking number - just ask(usually you will receive it in an automatic message when the product is shipped out). Please make sure your address is correct (and your Etsy account does not have an old address)- We are not responsible for wrong addresses. Shipping ranges from 4-10 business days average for US domestic mail. International shipping will be 9-15 business days for most countries but it can vary country to country. Please also be understand that I can only do my best and my part in shipping out the item in a timely manner. The rest is really up to USPS. While leaving reviews, please consider that the reviews are for my service and not USPS delivery service. So if you have issues with the delivery and do not notify me in a timely manner, then you should go to USPS site to leave them a review instead. Please try and understand and separate my service which is the quality of the items and meeting my processing time VS USPS delivery service. Make sure to watch the tracking and notify me AHEAD of time if you notice any abnormal status from USPS at least a few days head and I'll be able to try and work with you on it. Notifying me AFTER a long time has past and after your event doesn't leave me any options and I hope for your understanding when it comes to that. PROOFING: Once the digital proof is approved, that indicates it is ok to make the canvas and you have no further changes. It is the customer's responsibility to check the digital proof carefully and make sure there are no errors. We cannot make changes after the canvas has shipped. PLEASE PROOF CAREFULLY!! Custom orders are available upon request. Please contact us to discuss your needs. 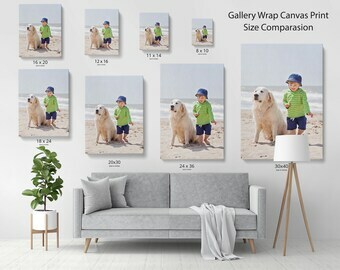 Please note that for marketing purposes, we will use past canvas images/proofs in our listing gallery ... if you prefer to not have your canvas/photo shown for marketing purposes in our shop, please let us know. GIFT CERTIFICATES (paper or e-cert) are available -please feel free to contact us. You represent and warrant to OC Canvas Studio, providing information or services, that you own and possess all rights or own sufficient rights of third parties necessary to copy, produce, print or imprint each and every document or other item and the portion thereof you submit. You agree and covenant that at OC Canvas Studio' request, and without further consideration, you will promptly provide OC Canvas Studio with reasonable evidence of such adequate and enforceable rights of third parties (i.e., consents, approvals, licenses or sublicenses), and agree that OC Canvas Studio may provide a copy of these T&C to anyone claiming an infringement of copyright/trademark in your document or to law enforcement or other entities as required by law or as OC Canvas Studio reasonably determines to be necessary to protect its rights or the rights of others. You agree that you will not: (i) transmit via or through the Site any information, data, text, files, links, software, chat, communication or other materials that is or that OC Canvas Studio considers to be unlawful, harmful, threatening, abusive, harassing, defamatory, vulgar, obscene, racially or ethnically hateful or otherwise objectionable; (ii) attempt to transmit any "virus," "trojan horse" or other software destruction or disruption device; (iii) intentionally or unintentionally violate any applicable local, state, national or international law, including but not limited to, any regulations having the force of law while you are using or accessing the Site or in connection with your use of the Site, in any manner; and (iv) invade the privacy or violate any personal or proprietary right (including intellectual property rights) of any person or entity. By using the OC Canvas Studio site, you agree to indemnify the OC Canvas Studio Parties for any and all claims, damages, losses, liabilities and causes of action (including expenses and attorneys' fees) incurred by them arising out of or relating to your breach or alleged breach of these T&C (including, without limitation, claims made by third parties for infringement of intellectual property rights). You agree to cooperate as fully as reasonably required in the defense of any claim. OC Canvas Studio reserves the right to assume the exclusive defense and control of any matter otherwise subject to indemnification by you. All our shop listings photos are not for sale! 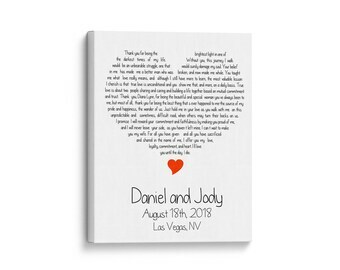 Can I customize/personalize my canvas print? Yes, most of my product listings are customizable. Once you placed your order and I received your information I will create a preview/proof and send it for approval. 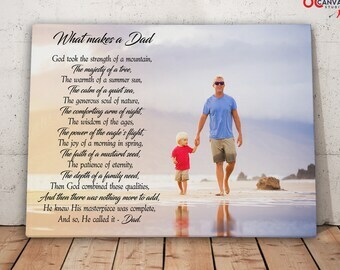 Once the order for a custom canvas is placed takes up to 9-12 business days to receive your product. 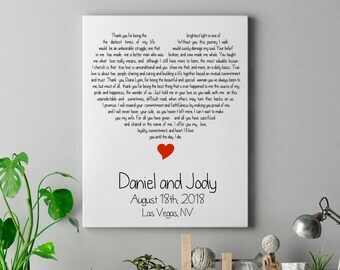 Yes, you can send us your personal photo and text/lyrics/wedding vows and I will create a unique custom product for you. 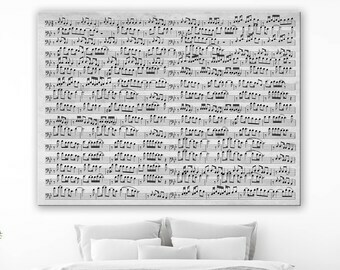 - your text(Wedding Song, Lyrics, Vows ... any Words/Text). - select your font style number (see photo #5 from the listing). 4. Once I have completed your piece, you will receive an email with a link to view your proof. 5. 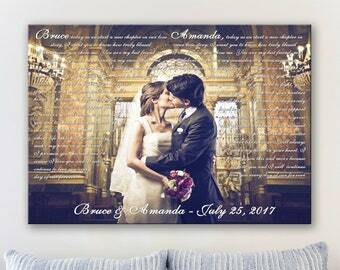 Once you have approved the proof, I will print on canvas your piece of art and ship it to the address provided during checkout. 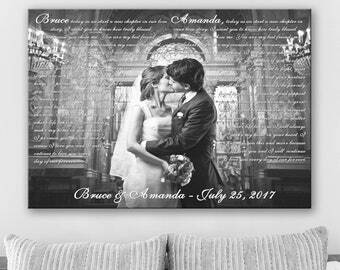 How can I know if my photo works for canvas print? 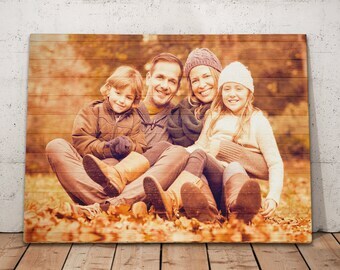 Please send me your photo via Etsy messaging system and I will let you know if it will work for a custom canvas print project.